It seems I have been consumed lately by yard projects. I blame it at least partly on my husband, as he started the push last fall to improve our landscape, especially our back yard, before we are too old to comfortably complete major projects. 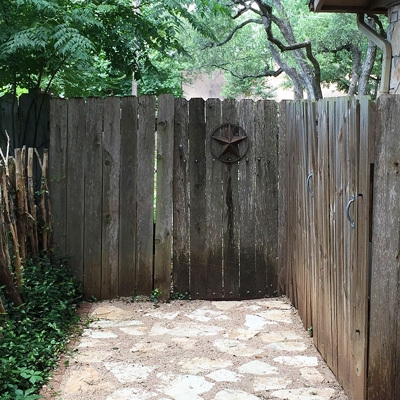 Last weekend I took a break from heavier work – like laying flagstone pathways – to do some faux fence painting. I say faux because I “created” the gate I wanted with paint, over and beyond the gate that existed. For me the color scheme was somewhat easy, as purple (like my purple irises) and blues have always been my favorite flower colors. So I just decided to focus on those colors (with the lime for contrast/pop), and develop a plan from there. Here is my gate before painting. Pretty sad, and I cannot even see the rusty Texas star on the center of the gate. It looks especially bad against the new flagstone walkway I laid a few weeks ago. 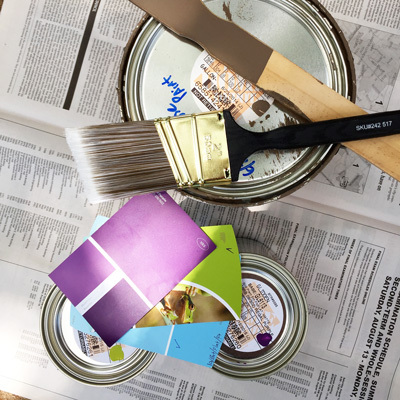 The first task was to paint the fence and gate the gray-brown shade, the same as the trim on my house. And here is the template I drew out on freezer paper for the arch in the top of the gate. I also create my sewing patterns from freezer paper. 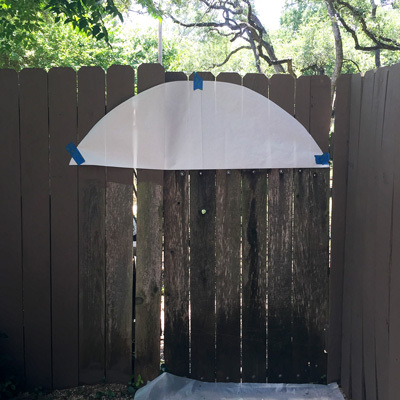 I taped it onto the fence and used some blue chalk, again a sewing supply, to trace out the arch pattern onto the wood. Last but not least I used a plumb line to make a straight line for the left edge of the gate, since of course our fence boards are certainly not straight! 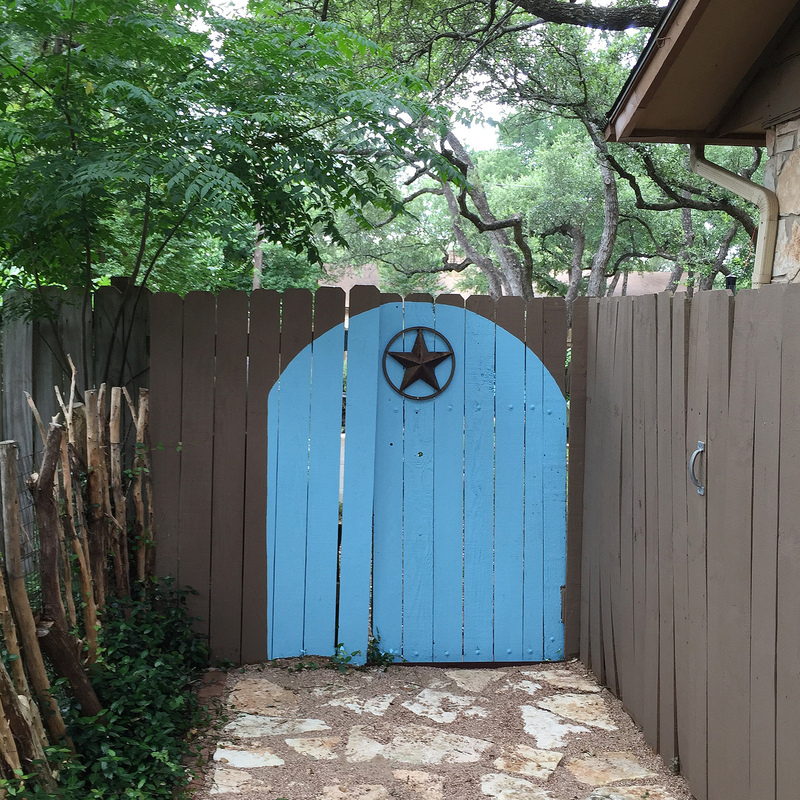 Once my pattern was marked on the brown fence/gate, I painted the bright blue faux gate, then added my rusty Texas star back to the gate, only in its new position. There – done! So much cleaner! My husband now wants me to paint our other side yard gate. I intend to order some dummy black hammered metal hinges online as a final touch to the right side of the gate. You could really use paint to create anything on your standard privacy fence. What would you like to create?